Palestinian teams and athletes are calling for a boycott of Puma over its support for illegal Israeli settlements on stolen Palestinian land. 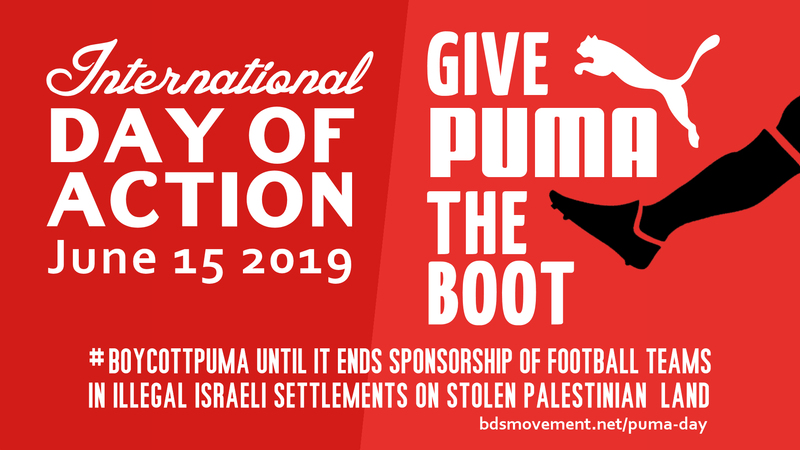 Global sportswear manufacturer Puma is the main sponsor of the Israel Football Association (IFA), which includes teams in Israel’s illegal settlements on occupied Palestinian land. June marks 52 years of Israel’s brutal military occupation. On Saturday, June 15, join the #BoycottPuma International Day of Action! Is your group interested in the #BoycottPuma International Day of Action? Register here for updates and resources! When companies like Puma sponsor and profit from illegal Israeli settlements, they give a nod to Israel’s far-right regime that its criminal land grabs and attacks on Palestinian sports can continue unabated. Across the world, groups are organizing campaigns and actions to demand Puma proves that its stated commitment to social justice isn’t just a marketing ploy. Take action at Puma shops, Puma offices or offices of Puma-sponsored teams, organize a workshop on Israel’s attacks on Palestinian sports, involve popular sports teams and fan clubs, join social media actions and more. See below for more ideas on how to join in. Now is the time to start identifying Puma locations and Puma-sponsored teams in your area. Register your group here for the International #BoycottPuma Day of Action to receive resources and updates. Below are just a few of the ways your group can get involved in the #BoycottPuma Day of Action. Involve local sports associations, popular sports teams, fan clubs and anti-racist tournaments in your actions. And get creative! Bring sports themes to your protests and livestream actions on social media. Get creative. Organize a mock football match or sporting event at a Puma shop. Use Puma’s store locator to find Puma branded shops in your city. Deliver the letter from 200 Palestinian clubs to Puma offices. Puma has offices in Germany, the UK, Spain, Portugal, Italy, Sweden, Norway, Finland, Denmark, Austria, Netherlands, France, Czech Republic, Poland, Turkey, South Africa, UAE, the US, Argentina, Chile, Mexico, Peru, India, Australia, Singapore, Malaysia, Indonesia, Japan, South Korea, Hong Kong. Join #BoycottPuma social media actions to culture-jam Puma with your friends.